A healthy roof is designed to help moisture and heat build-up escape. Owens Corning VentSure® Ventilation products work together so air flows naturally up into the attic and out again, taking excess heat and moisture with it. Get a beautiful, longer lasting roof thanks to the Owens Corning™ Roofing System. Wind damage can be traced back to the first row of shingles. If that's not done right, the whole roof can fail, since wind at the eaves can get underneath and push upward on your shingles. Use Owens Corning™ starter shingle products to make sure there is a secure seal where it matters most. Owens Corning™ Oakridge™ Shingles have a soft, dimensional look that can make your home look warm and inviting. Equally important, they're a durable choice in shingles. Choose Oakridge™ Shingles for your home's protection and beauty. We have all been victim to it before: the same old, same thing. The majority of homes in America have composite asphalt shingles as their main roof material. Loved for their variety of color and ease on the wallet, these shingles have been around since most of us were born. Just because we are used to a certain roof material and style is no good reason to stick with it forever. With so many new choices, many homeowners are surprised to learn that making changes to their roof can actually increase the value of their homes. As technology advances, so do the products that are available for our homes. We now have many different materials that can be used as the façade of our home. We no longer have to choose between wood or metal siding, there is brick of all colors, stucco, cement, glass and even earthly materials such as clay. Roof materials have also evolved over time and we now can choose from clay or slate tiles, metal panels, wood shakes and even recycled varieties of asphalt shingles. Solar panels have become more popular, allowing for many people to reap the benefits of alternative energy sources generated by their roof coverings. When it comes to upgrading your roof style you should consider the how the new style will impact the look of your home as well as your neighborhood. Don't choose a style that will clash with the style and color of your home. For example, if you live in a Southwestern region and are considering a metal roof, a silver metal roof may seem obtrusive to the natural, earth tones that are prominent in that region. Instead, choose a copper or gold colored metal roof. If you live in a stucco home, or one with a cement façade, a wood shake or clay tile roof may not match the overall theme of your home's style. Generally, you want to follow the theme of (a) the region in which you live, (b) the colors of your home and/or neighborhood homes and (c) the time period in which your home was built. Always try to pick a roof style that not only matches in color and theme, but adheres to the time period of the home as well. A Victorian style home would look off putting if it had a flashy clay tile or shiny metal roof as these homes symbolize elegance and tradition. A newer styled roof material would not match the historical heritage of the home. Instead, it would be best served by a gray or charcoal colored roof made out of dark stained wood shake or slate tile. To maximize the look of a Colonial style home, use a neutral (gray or tan) wood shake or matte metal roof material. The color of the roof material should be a complimentary color to that of the window shutters or columns. Southwestern style homes tend to look best with earth tones such as tan, gold, copper and browns. Tiles or copper metal roof materials look best on these style homes. Solar panels are also a great option for homes in these regions as they tend to get a lot of sun the whole year. Beach front or coastal community homes have cooler colors in their color schemes. A shiny aluminum or steel roof would accentuate the color scheme well in these homes. However, always check to make sure the metal is treated to prevent any rust or damage caused by the increase in moisture. 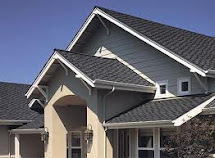 Traditional modern style homes, those built between 1980-2000s, have the most flexibility in roof material choices. These homes tend to have a more generic shape and color scheme, and most neighborhoods have similar or repeating pattern, homes. Since these homes tend to be similar to the neighborhood homes in style and color the only main consideration is roof color, which should be in the same color palate as the rest of the home features (i.e. shutters, trim, garage door, front door etc.). Most often, homeowners only pay attention to their roof if there's water leaking into the house, if they notice brown stains on the ceiling, or if there's cracked paint or peeling wallpaper - all obvious signs of a leak. But roofs can leak for 2 to 4 years before you see evidence on the inside the house. By this time, the leak may have caused dry rot, fungus and insulation damage - and the need for major repairs or even a completely new roof. To add years of life to your roof, and to avoid premature roof failure, it is a good idea to have your roof inspected at least once per year. The National Roofing Contractors Association (NRCA) recommends two roof inspections each year - once in the fall and once in the late spring - before and after the tough winter season, especially in colder and rainy climates. You can do a preliminary inspection yourself, looking for shingles that are buckling, curling, blistering or missing altogether; loose material or wear around chimneys, pipes and other penetrations; and excessive amounts of shingle granules in your gutters, which indicate advanced wear. But it is better to get a professional to inspect your roof - someone who knows what they're looking for, and who's used to walking around on the roof. A roof inspection by a professional should include a complete inspection of the roof, parapets, flashings and drainage system. They should present you with a detailed report of conditions they found, including photographs and a sketch of the roof indicating the problem areas. Many roofing contractors will provide a free roof inspection, including a written estimate outlining the required repairs, as a means to solicit work. This is a fine approach if you already have a relationship with your roofing contractor. If not, to be cautious, get two inspections done by separate companies, or hire a roof inspector who doesn't also offer repairs. This way you can be sure that the inspector isn't recommending unnecessary work. Richard Boon, Deputy Technical Director of the Roofing Industry Educational Institute, recommends paying for a roof inspection. He figures you will end up paying for the inspection anyway, as it will be hidden within the cost of the repair. The cost of a roof inspection is negligible compared to the cost of repairing or replacing a roof which makes regular roof inspections a wise investment. Wouldn't you prefer to find potential leaks and related damage before they become real problems? And before they lead to major repair bills? We asked several homeowners what they think about their GAF shingles - here's what they had to say! How Can Seamless Gutters Save the House? When you purchased your home were you more likely to spend a lot of time focusing on how it would look or the longevity of the construction? Even if you paid a lot of attention to the condition of the roof and performed regular maintenance, repaired the plumbing and electrical to make sure that everything was in tip top shape, it still doesn't stop the aging of the building materials. Maintenance, repairs and replacements aren't just for the huge projects or the appliances, it also includes the relatively little things that you think take care of themselves like the gutter system. In real life, they need attention and restoration just as much as any other part of your home. A great way to end the concern and the hassle of maintain an old gutter system is to replace it with seamless gutters and a debris cover; they will save you time, energy and money each year, regardless of the season. But, it's important to learn about all of the ways that the old system has damaged your home from the outside in because those issues have to be repaired and restored as well. A home inspection is an important step in saving your home with seamless gutters installation. If you've spent many years with an old or damaged gutter system, your home has suffered greatly from the lack of protection from rain, melted snow and ice. There was a heightened likelihood of leaks all along the length of the gutter's seams and where the spout loosened. The downspout shifted and drained back towards your property walls instead of out as it should. The fact of the matter is that bad gutters can damage your home in multiple ways. The insufficient drainage can cause damage to the edge of your roofing system by way of ice, debris and moisture getting trapped there. The moisture can permeate the roofing layers and seep into the walls of your attic or inner rooms. The damage on and below the ground level is far-reaching and expensive as well. Rainwater can leech into your basement, erode your landscaping, shift your walkways, and a host of worse damage to your foundation as time goes by. Seamless gutters with a debris cover help to ensure that windblown debris can fall to the ground instead of cluttering your gutter while the water is free to enter and exit the spout away from your property as it should. When you replace your gutters with a more efficient and attractive alternative, you'll notice how important the strength of each component of your home's construction is to the entire structure. Do you feel a draft in your house? Is it cold in the winter and hot in the summer no matter how hard you blast the air? You might have an insulation problem. Having bad insulation in your house can cost you a fortune. While you are blasting the heat in the winter it is going right outside and the air is coming in all over the place which means you are just splurging all that money for nothing. With proper insulation you can cut your heating bills and cooling bills into a fraction of what you are spending now. It starts with the roof. Obviously heat rises. When you are heating your house all the heat is rising and expanding outward which means it is leaving your house and being replaced with cold air from outside. If you just insulate your roof without even starting with the rest of the house, you could already be saving an incredible amount of money. In the summer the heat can get in through the roof and seep in through all the cracks and heat up the cool air in your house so you get spots of cold air and the rest is warm or hot air. Your air conditioner might not be broken. It could very well be your insulation. Crawl spaces can be letting the unwanted air in because it is not insulated. The vents and piping leave un-insulated holes all over the place that allow the air to come up into the house from the floor. Light fixtures let air in too because the hole around the entrance of the wires is not insulated. Window panes are the same. Those are the most common. If you don't have storm windows or insulated window frames, those are the most common ways to heat up and freeze your house. Insulating your house with spray foam is the best and newest way to go. It lasts the longest and makes sure to cover all holes all the way without any rivets or cracks in the regular type of foundation. You may pay more initially but over time you will be saving the most because of the heating and cooling bills and also the value of your home will go up. Since spray foam lasts a lifetime you will essentially be paying less because you won't have to re-insulate. You can find a professional contracting company that will help you with your insulation and offer you the best price they can to ensure you happiness and comfort in your own home. Your home is a valuable investment protected by your roof; more importantly, the roof is an integral component of the structure of your home that should receive the proper care. Indeed, roofs must be replaced from time to time to ensure that the contents of your home and the building itself are safe. Therefore, regular roof maintenance is a standard homeowner responsibility; one that can have a major impact on the lifespan and quality of said roof. Needless to say, many homeowners feel daunted by the task of roof repair and maintenance, and for good reason. Roofers are highly trained professionals who can keep your roof in tip-top condition. Still, as a homeowner, there are some tips that can help you keep your roof in good condition. Even if like most homeowners you are not confident doing the repairs yourself, your vigilance can help keep roofing costs to a minimal. The following guidelines will help you know when it's time to call your roofing professional. Trees growing close to your home and roof can cause a number of problems. Not only do trees provide shade, but falling leaves and needles can clog drainage and cause water to backup onto your roof and potentially cause severe damage. Shaded areas of your roof are more susceptible to moss growth, and overhanging branches can scratch or gouge your roof. In fact, wind can even cause large branches to break off and fall onto your roof causing significant structural damage. If you have even one large tree near your home, you should have your roof inspected regularly. Professional roofers can make minor repairs caused by trees, but can also assess the future risks associated with these trees. Black or green streaks on your roof are a sure sign that some kind of organism is growing. Mould, algae, and fungus are among the most common organisms that can wreak havoc with your roof. They tend to grow in humid regions and especially on north-facing portions of your roof; and when left unchecked, these organisms will cause the deterioration of roofing material which will eventually result in leaks. Again, if you think you have a problem with mould, fungus, or algae, call your roofing professional immediately. He or she should be able to check for damage and make recommendations to prevent future growths. If you are confident enough, you should regularly get onto your roof and search for signs of damage. Missing or torn shingles, water damage or rot, broken tiles, or other signs of damage should be dealt with immediately. Still, not everybody wants to climb up onto the roof, and for the sake of safety you should always be willing to call in a professional. Minor repairs are easy enough and can save on future roofing costs. Don't wait for your roof to show extreme signs of damage as your only solution may be to have a new roof installed. Having your roof professionally inspected every 3 or 4 years is a great way to maintain the quality and integrity of the structure.